The 1980s were full of guilty musical pleasures, a true renaissance of glamour and guitar riffs. Every week brought an endless supply of new and more extreme acts ready to rock our collective faces off. But beneath the exuberant performances, pyrotechnics, and hairspray (so much hairspray), there are incredible stories waiting to be mined. The humans behind these acts lived some of the most extreme and tragic narratives ever to unfold in any musical span. 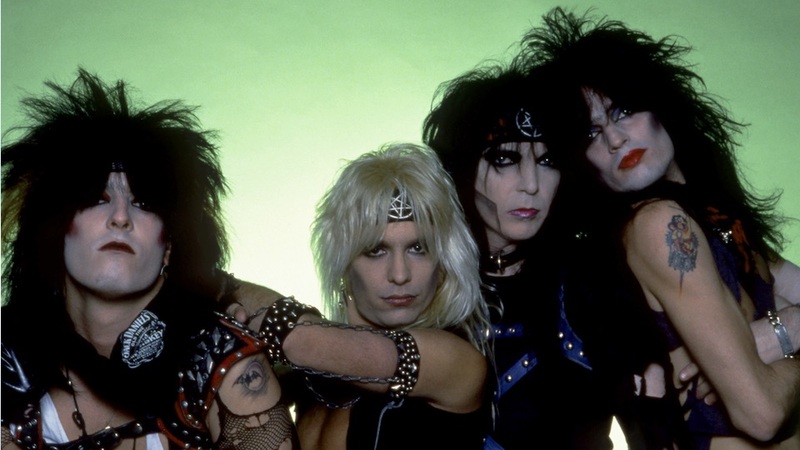 With the recent release of Netflix’s The Dirt, the sensationalized story of how Motley Crüe became the signature “hair metal” act of the decade, we thought of a few other 80s acts that would make for an equally engaging biopic. So crank your amps to “11,” break out the leather and get ready to bang your head! It would be easy to write Stryper off as just a “Christian” knock-off of hair metal. Yet the act had an incredible story to tell while thriving within both the secular and religious markets. If you’re looking for an act in the era that embodies the metal style, outrageous stage production, and searing vocals, then Stryper belongs at the top of the conversation. Selling more than 10 million records, with the platinum crossover To Hell With the Devil making up for over 2 million, the act toured with the likes of Bon Jovi and Ratt, while being a video mainstay on MTV. While performing, drummer Robert Sweet would rig his drums to move in different directions to give the audience a gaze at the top of his kit. The rest of the band was known to fire official Stryper-licenced Bibles into the crowd. Of course, some of this is pure camp, but it’s what made them such a worldwide spectacle. It was not all Bibles and headbangs, however. Once the act expanded their sound, they drew the ire of Christian evangelicals who had previously supported them. Not only was it seen as an “evil” genre, but the band was believed to have succumbed to the dark side by not mentioning God enough in their Against the Law album. The backlash was so harsh, that their music was pulled from Christian bookstores and they were even picketed. If it wasn’t for Stryper taking the criticism in stride, acts like Underoath, P.O.D., and Skillet would not be as free to express themselves creatively in the contemporary. While many acts from the era have fallen apart amidst drugs and scandal, Stryper remains together. That may be their most impressive feat — and a story worth telling. For a long time, women were believed insufficiently tough to play rock guitar. For many, the message was clear: “stand in the back, look pretty, and don’t get in the way of the male lead”. Bands like Heart and The Runaways started to change that narrative in the ’70s, and many 80s acts continued to benefit from their hustle and talent. These strides helped the all-female metal act, Vixen. Formed while the members were still in high school, the Minnesota band moved to Los Angeles, where they eventually worked with the likes of Deep Purple, KISS, and Ozzy Osbourne. An earlier formation of the act named Diaper Rash appeared in the 1981 movie Hardbodies. While recording their self-titled debut, Richard Marx was brought in by EMI who thought the band needed help. The motivation behind this is unclear, but it did help give them their signature song “The Edge of a Broken Heart”. While being together in some form since 1971, the act really took off late in the ’80s. This could be chalked up to the largely male-dominated genre, but the act definitely belonged in the hair metal explosion of the decade. If their David and Goliath story isn’t enough to form the basis of a movie, various in-fighting, and relationships with some of the biggest names of the genre would definitely make for a neon-colored, hairspray-fueled epic. Matt Simon is the co-editor of EartoToTheGroundMusic.co where he regularly covers and chats with rising indie songwriters. Additionally, he works as an educator with interests in music history, theology, The Simpsons, and culture.